Chop up your jeans. Going up the outside seam, cutting as closely to the edge as possible, will yield you the most fabric in an easy way to work. Tape together your pattern. 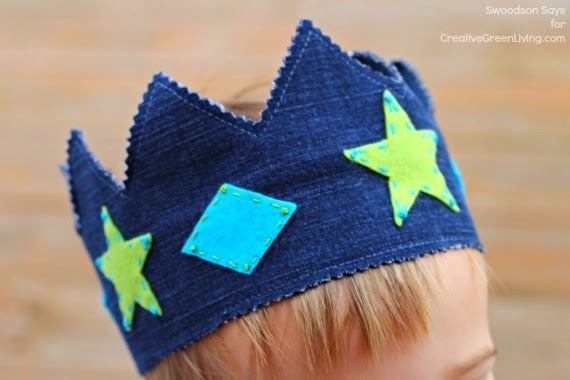 This crown is shown on my large-headed toddler, who wears youth medium hats. He used the two end pieces and one middle piece. Test with paper before tracing on to the jeans. 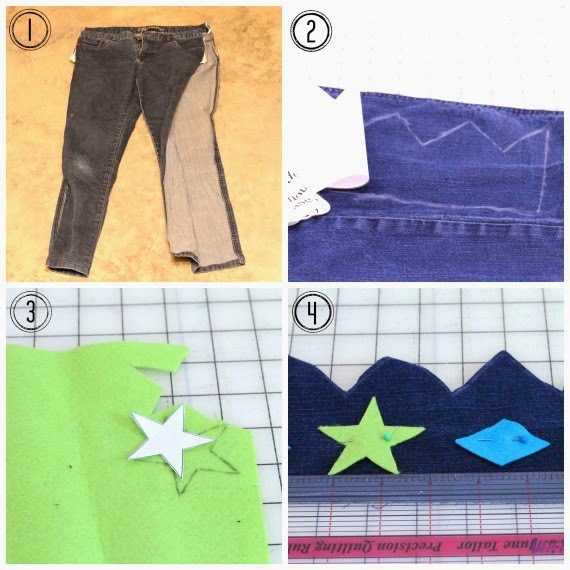 Once you have the length right, tape it together and lay it down flat on your jeans and trace with chalk, cut out, repeat on other leg. Trace optional felt shapes if desired for embellishment. Use a ruler to make sure your shapes are lined up and pin. Hand or machine stitch the shapes on. When figuring out placement, make sure to leave space at each end of the crown where the hook & loop tape will go. Pin or clip the two crown pieces together, with the wrong/light sides facing one another. Set up your machine to sew with a 1/4" seam allowance - that is usually close to the edge of your presser foot, but may vary depending where you have the needle set and your machine. 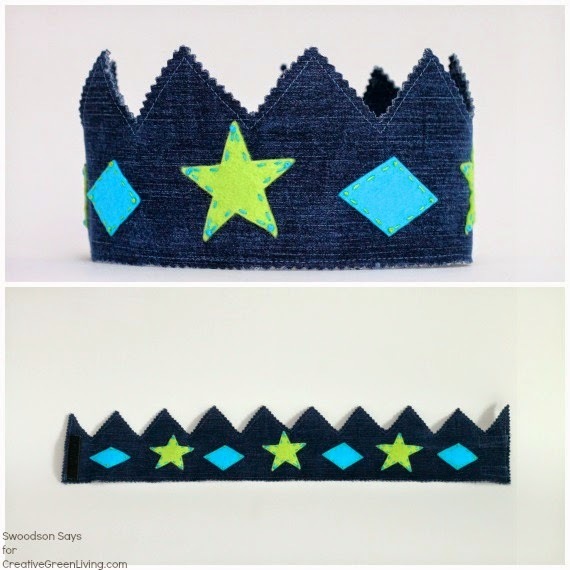 Sew all the way around the crown, slowing down and pivoting at each angle. If there are a few spots that don't match up perfectly, don't fret because they will be trimmed shortly. 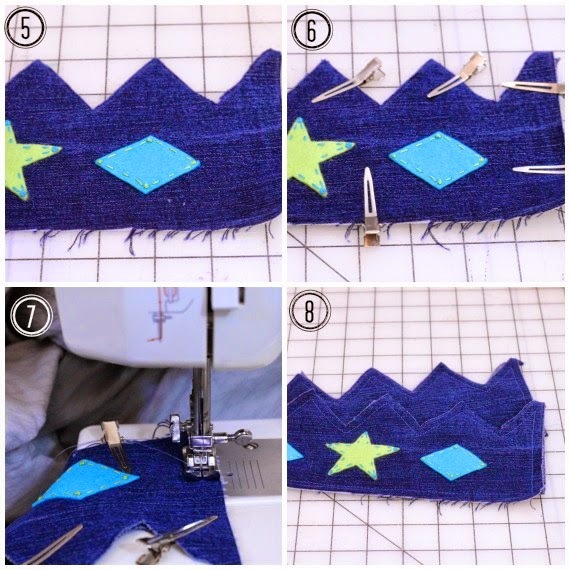 Make sure to sew back and forth a few stitches at beginning and end to secure the stitching. 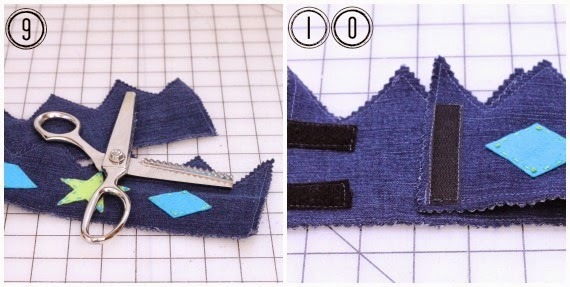 Use pinking shears and trim around all edges, making sure not to cut through the stitching line. Sew your hook & loop closure on to each end. Putting two small pieces horizontal and one longer piece vertical will give you more wiggle room as your little one's head grows. Sew securely around all edges of each piece, making sure to sew back and forth a few stitches at beginning and end to secure the stitching . Hi! 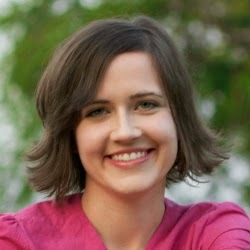 I'm Stephanie & I blog at Swoodsonsays.com about sewing and crafting for our family. 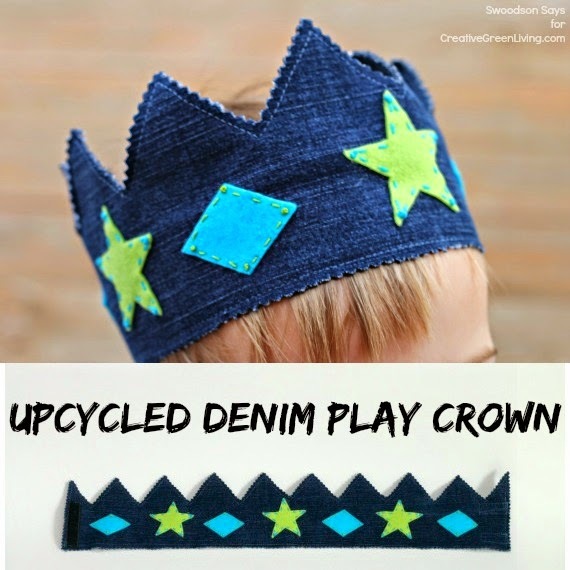 I love upcycling and using fabric scraps! I sell PDF sewing patterns for handmade toys and spend way too much time online, you can find me on: twitter/pinterest/facebook/instagram/google+!